« An Urgent Notice to Collectors Club Gmail Subscribers! The winner of the LongLocks HairSticks Facebook Banner Photo Contest is (well, *are*), Amy and Dee Ann Sagor! 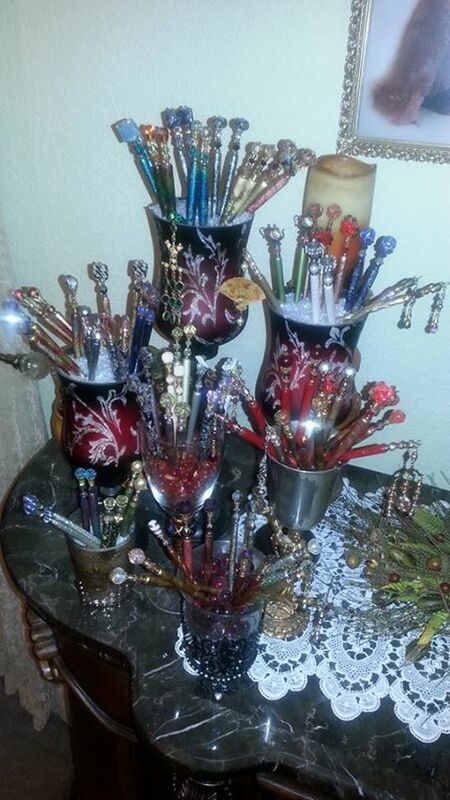 Amy posted the below image of her and her mom’s LongLocks Collection as her entry into the contest. She told me afterward that she didn’t arrange their LongLocks HairSticks for the photograph, they actually store them that way! How fabulous is that? By the way, check out the corner of the photograph you can see in the background, that’s Amy’s gorgeous hair! While trying to decide on a winner I had such a hard time that I decided to award two extra prizes that weren’t part of the original plan! Second place went to Ann-Marie Lavelle and her gorgeous photograph of her very first pair of LongLocks HairSticks. Ann-Marie won a $50 gift certificate for her second place prize. She is a jewelry artist herself, and you can see her lovely pieces in her Trinksy shop, Ampl Creations. And since *all* the entries were so good, I decided to give everyone who entered but didn’t win a top prize a 20% discount coupon good at the LongLocks Boutique through October, because everyone deserved to win. Thanks so much to all who participated! I had a lot of fun and hope you did too! You are just toooooo good to us addicts!